We are sisters living in Osaka who love interacting with people through tasty dishes! :) We have certificates of food coordinator and macrobiotics, and value using safe & healthy ingredients. 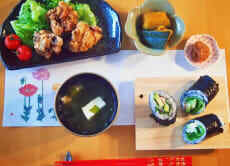 Our class offers 3 dishes and 1 soup, which is authentic Japanese home cooking. The unique point is that you also can make rolls! Also we prepare a dessert after the meal. Please enjoy the experience of a different food culture through this class!